Carmel is highly visitor-friendly and most of its boutique hotels, inns and B&Bs are mixed into the fabric of the downtown area, making it easy to walk from your hotel to dinner, shopping or the beach. Why Should You Go? Will You Like Carmel? Carmel is popular for laid back, romantic getaways. Carmel is one of California's most dog-friendly tourist destinations, with several hotels that cater to the canine set and plenty of dog-friendly restaurants. If shopping is not one of your interests, you may find Carmel a little short on other things to do, but Point Lobos is just south of town and great for hikes, oceanside walks, and scuba diving. We polled more than 150 of our readers to find out what they think about Carmel as a weekend getaway spot. Rating it from Awesome! to Yuck!, 67% of them gave it an Awesome rating. If you want to visit the other towns on the Monterey Peninsula, read our guides to a weekend getaway in Monterey or Pacific Grove. Carmel weather is fine most of the year, but it can be rainy in the winter. The most popular time for visitors is summer, but it's less crowded off-season, and if you can manage to get away mid-week in fall and winter, you'll find it quiet and relaxing (and the hotel rates lower, too). Don't Miss: If you've only got a day to spend in Carmel, enjoy a stroll around downtown. 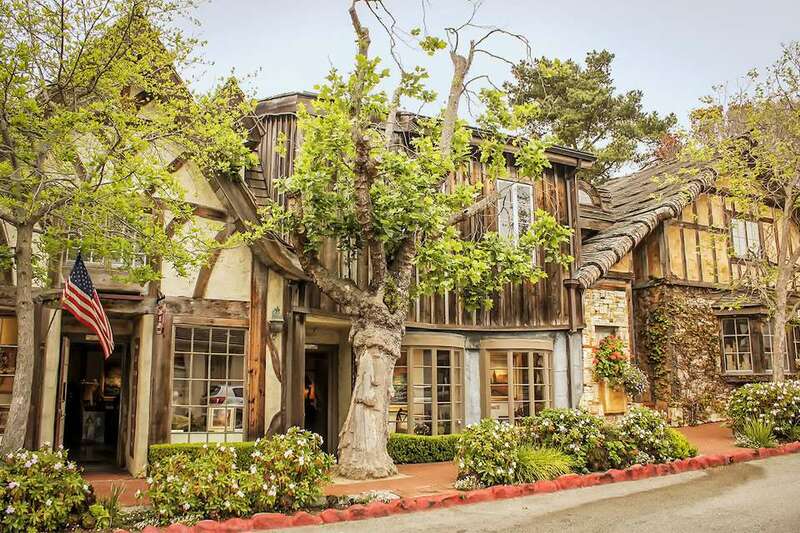 While you're walking, Carmel's hidden courtyards are worth seeking out. You'll find the Court of the Fountains just off Mission Street between 7th and Ocean Avenues, but we'll leave the rest for you to discover for yourself. You can pick up a self-guided courtyard walking tour brochure at the visitor center on San Carlos between 5th and 6th. For more ideas, check out the top things to do in Carmel. February: Pebble Beach Pro-Am Golf Tournament Even if you don't want to go, you should know when this one is going on because of the crowds it attracts. April: Big Sur Marathon You may not want to run in it, but it closes the highway in Big Sur for several hours (which could put a crimp in your day's plans). Carmel residents joke that parking fines are the town's main source of income, but there's no reason you have to contribute to their coffers. Start by knowing that enforcement is strict, in terms of time limits and other simple things like making sure your vehicle is within the boxed area. Check the time limit signs on the same side of the street you're parking on to be sure you know how long you can stay. Parking is limited to just an hour or two in many areas of downtown Carmel. It's an annoyance if you want to stay all day, but you're not trapped. To find a place where you can leave your vehicle all day, follow the signs that say "public parking" or just turn off Ocean Avenue and drive until you find street parking with no limited times posted (usually a couple of blocks). When you're checking the weather for your trip, check it for Carmel (not Monterey). It's surprising how different conditions can be in the two places and what might look to be a cloudy morning in Monterey might be sunny in Carmel. You can find public restrooms in the city park at Ocean Avenue and Junipero, and also at Lincoln Street and 6th Avenue behind the library. You'll also find restrooms on the top level near the back of the Carmel Plaza shopping center. For reasons unknown to us, properties in the town of Carmel do not have numbered addresses. It's less of a problem than you might think at first, and most places will simply give you the streets they're on and between. Carmel is a great place to go if you're traveling with your pet. You'll find lots of pet-friendly restaurants and accommodations, too. Ladies, leave your high heels at home. While adding to Carmel's charm, rustic cobblestone paths and walkways provide uneven footing (and are an excellent way to ruin that prize pair of designer shoes). Take a flashlight if you plan to walk around town after dark. About two blocks away from Ocean Avenue, streetlights are sparse. Romantic pleasures in Carmel are the simple ones. Walk hand-in-hand through town or along the beach. Sip an evening cocktail at the Highlands Inn while watching the sun set over the Pacific or cuddle with a nightcap beside the outdoor fireplaces at The Forge in the Forest. There's no better place for Sunday brunch than Mission Ranch. If you're looking for some excellent cuisine, you'll find it downtown. Aubergine restaurant at L'Auberge Carmel rates a near-perfect 28 (out of 30) from Zagat readers and its chef was voted one of America's best new chefs by Food & Wine magazine in 2013. With outdoor fireplaces and much California atmosphere, Forge in the Forest is one of my Carmel-by-the-Sea favorites. Other places may boast better cuisine, but none can deliver better ambiance. The Cypress Inn is dog-friendly and serves afternoon tea to both owners and their pets. It's a great place to relax after a few hours of tramping around town. Check out how to find a place to stay in Carmel. You can also find a few campgrounds near Carmel if you use the Monterey and Carmel camping guide. If you live within a couple of hours' drive of Carmel, one night in a hotel may be enough if you can find a hotel you like that doesn't have a two-night minimum stay. On previous stays in Carmel, I have enjoyed L'Auberge Carmel and the Cypress Inn, which is extremely dog-friendly. For help getting the best possible deal, read about how to find a good place to stay, cheap or go straight to Tripadvisor's reviews and price comparisons on hotels in Carmel. Carmel is 120 miles south of San Francisco, 350 miles north Los Angeles and 193 miles from Sacramento. The nearest airport is in Monterey, although you'll find more flights into San Jose.